You won't be singing the blues when you catch a glimpse of the amazing tones of these 14k solid gold stud earrings with natural blue topaz. Those who love the color blue will instantly fall for these amazing earrings with lots of sparkle. Two marquis cut stones are attached to 14k yellow, white, or rose gold posts that are held in place with friction push backs. 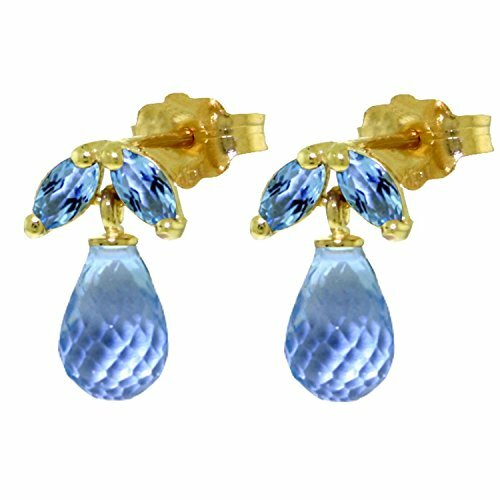 Beautiful briolette cut blue topaz dangles below each stud, adding plenty of color and sparkle to these amazing earrings, which have over three full carats of beautiful natural gemstones to make them sparkle when dangling from the ears.